A sample back-issue of the Explore daily reading notes for evaluation purposes. The sample issue provided is a back issue. Many Christians find it difficult to regularly read the Bible. It can be quite a task to find one's way around such a large, diverse and ancient collection of writings. Some of the books in the Bible are historical, some are poetic, some are prophetic, some take the form of letters. The big question is - how does it all fit together? The best way to find the answer is to adopt a pattern of daily Bible study and prayer. Not only does this give the reader more knowledge of the Bible, but more importantly it offers a chance to listen and hear God speaking personally to them through His strongest medium - The Word. Explore gives you the opportunity to delve into areas of the Bible that have perhaps eluded you for years: the laws of Leviticus; the wisdom of Proverbs; the meaninglessness of Ecclesiastes; the pain and suffering of Job; the terrifying apocalyptic imagery of Revelation. Explore shows how the Old and New Testaments are linked and how God's promises of salvation for his people are fulfilled in Jesus Christ. It also challenges the reader every day to be more like Him. If you want reliable guides to lead you, with a light but faithful touch, as you work through and apply chunks of Scripture in your own life, there's no need to look any further than this wonderful series. Reliable, faithful and accessible. Fantastic for anyone who wants to get started in spending regular time in God's Word. A trustworthy and convenient tool for helping people to dig into the Scriptures themselves. It is good to study the Bible systematically and Explore facilitates just that with comment by sound biblical scholars that not only challenges the mind to grapple with truth but also engages the heart to bring about change in thinking and conduct. We have been using 'Explore' for a couple of years and find them very good. They are enjoyable, thought provoking and a good way to read and study the Bible. In my opinion these are the best Bible reading notes out there. Almost always on the money. The notes drive you back to the text and they offer wonderful insights, alongside helping application and prayer. I use Explore and I encourage my Church family to choose Explore. I have been using Explore to study the Bible for several years, and my 16 year old daughter now uses it too. It is excellent for making you look carefully at the Bible text and gives a lot of helpful links and references to other passages. The app is ideal for studying the Bible on my frequent long rail journeys. I have used various daily reading helps over the years, have recently finished Search the Scriptures, and chose Explore after looking around at what was available. I am really enjoying it and looking forward to each new episode! 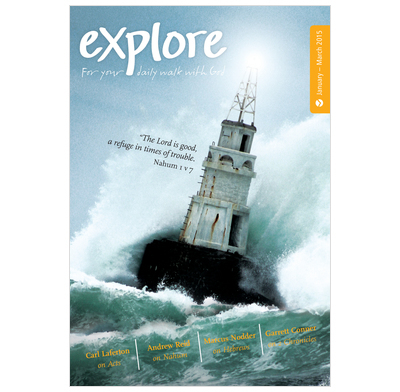 Explore is very well put together and very helpful in helping you to ask questions of the passage - what it means and what the Lord is saying through it. Highly recommended.